My friend Marianne Elliott introduced me to the wonderful Dr. Melody Moore. She’s a Clinical Psychologist who specializes in the treatment of Eating Disorders and is the Founder/Chief Loveologist of Embody Love Movement, a non-profit whose mission is to inspire and empower girls and women to embrace their inner beauty, practice kindness toward themselves and others, and believe in their purpose to create meaningful change in the world. Don’t you love that! And get this, her activism is all about creating a world where all see and treat themselves as lovable without condition. I can get behind that! 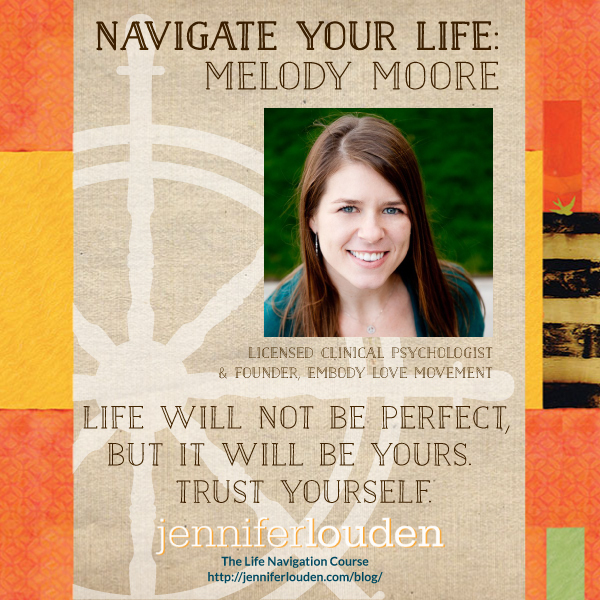 Thanks Melody for coming over and sharing your thoughts about shaping your truest life with no holding back! This little moment of self-reflection turns into self-empowerment and I can use the wise words from my inner knowing, from my soul, to influence the fear that is coming up inside of me to simmer down so that I can act with courage. Do you have a daily morning ritual to help you remember what’s most important to you? If so, is that easy or a struggle for you? Yes. My morning ritual, before I allow myself to even get out of bed, is a prayer of intention. I pray to the wisdom of the universe that I be an instrument of love throughout the day. I pray that I be shown the places where I am not being loving to myself, and that I act with compassion and empathy toward myself. I pray that I be shown how and where I can show up as love for those whom I encounter. I pray that I remember that I am born of love and that, like everyone else, I am here in this day and on this earth for a purpose. And that ultimately, that purpose is to be called home to the love that I, and we all, are born into and from. I pray that I be patient with myself and with others for all the ways that I become distracted or forgetful of this sole purpose. And, I pray “thank you” for the opportunity to be in the day and for whatever comes inside of it. The prayer itself is easy, it seems to flow from a deeper part of my soul. The living of the prayer, hell no. That part is a struggle, every day, which is why the prayer is not a one-and-done. Instead, it is a daily ritual, which has become habitual, and I hope, as I continue to pray, it becomes easier to love and be loved. My yoga practice. Yoga reminds me to breathe, which is the most necessary thing for me in those moments. When my head is about to pop off, it is likely that my other body parts are either hanging on by a thread or being weighed down by a boulder, too. Yoga gives me room to reconnect my head to my heart, and to realign my intentions with my actions. Yoga gives me perspective on my little “I” self that can become so self-important that I am convinced that my time and my attention exist in a vacuum. Yoga reminds me that I am actually connected not only within myself, but to the universe around me, and all beings within it. I can then see that my time and attention are not such a big deal, as compared to the whole of the universe, and calm down about what I am perceiving to be life-or-death deadlines. When you want something or want to affect change in the world, how do you get into action on that desire? How do you think about it, talk about it, let it become real to you? I sit with it. I trust myself that I am a mega-manifestor. When I want to create something in the world—a project, a program, an organization, a work of art—I know that I have the capacity to do so. In the past, I have erroneously gone too fast. I was like a rocket ship, taking quick action on whatever filled my heart with passion. With experience, I have learned to go slower, to be more methodical, to consider an exit strategy, to be mindful to the impact of my idea on others. In sitting with it, I have time and space to develop the idea more fully. I keep it with me before sharing it with others, at least for a little while, so that I can be certain of what I am thinking and feeling, about my motivations, and about the effects of the potential idea on the other areas of my life, including relationships. During this gestational time, I think—a lot. I write, on the notes in my iPhone, in my journal, in emails directed to me, from me. I sometimes talk into my voice memos as well. When I feel ready, I pitch it, to my trusted friends and mentors, and try to be open to feedback. Next step: I gather a team. I know that I cannot manifest anything as long as I am working in isolation. Plus, that’s no fun. From there, it is a matter of letting go of the particular outcome and surrendering to doing my best and allowing that right effort to be enough. What do you do to recharge especially in the face of despair and overwhelm? Do have any “daily joy” rituals or practices? I’ve already mentioned yoga, which, for me, could be woven into every answer. Another ritual that organically developed for me in the face of despair is to re-read cards and letters that have been written to me by friends, parents, clients, students, and anyone willing to show me what I have meant to them. In moments where my internal critics start turning up the volume on how useless or pointless I am, I soak in these words and use them to remind myself that I can, and I have, and I will, in fact, make a difference. I use the words as a salve to my hopelessness and as a reminder of the possibility inside of me. I keep a collage of these letters both in my office and at home, and look to them often for encouragement and empowerment. I have found that this practice can completely shift my mood and increase my confidence. It also makes me incredibly grateful to the authors for their willingness to be vulnerable in their expression, and reminds me to open my heart and reveal my truth to others, too. I feel so grounded reading this and that there is always a peaceful self-kind way to proceed. What a spacious, sweet way to approach your life!